Four fighters earned an additional $60,000 for their efforts at UFC 99 on Saturday. Rich Franklin, Wanderlei Silva, Mike Swick and Terry Etim all received awards for strong performances which were monetarily recognized by the UFC at the post-fight press conference. Both Rich Franklin and Wanderlei Silva went back and forth for three rounds to earn “Fight of the Night” honors in a very hyped up main event. 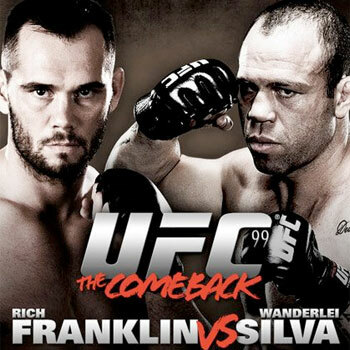 Although it was a unanimous decision, many believe that Franklin narrowly edged out Silva on the scorecards. Swick didn’t KO Ben Saunders, but he did stop him after a flurry of punches that forced the referee to step in and stop the fight, which gave him the “Knockout of the Night”. On the undercard, Terry Etim scored a submission victory over Justin Buchholz to earn “Submission of the Night” honors and some extra cash in his pockets.